CKDG-FM 105.1*, a 12-year-old commercial ethnic radio station in Montreal, is up for licence renewal, and for the third straight time the Canadian Radio-television and Telecommunications Commission believes it has failed to meet the requirements of its licence, by not serving a sufficient number of ethnic groups and not airing enough Canadian music. In 2010, when the station’s licence was first renewed, the commission found that it had failed to pay $42,022 in required contributions to Canadian content development. As a result, the commission renewed the licence for just over three years instead of a full term of seven years, and added a condition of licence requiring it to repay the shortfall by August 2011. In 2013, the second renewal noted that the station failed to meet that repayment deadline. Owner Marie Griffiths blamed the economic recession for putting financial pressure on the station, and said it would be repaid by August 2013, even trying to offer post-dated cheques as proof of this. There were also paperwork issues, getting annual returns to the commission on time. The CRTC again renewed the licence for a shorter term, until August 2016. This time, the compliance issues aren’t about Canadian content contributions (a new policy exempts stations with revenues under $1.25 million from having to make them) or filing annual returns, but related to programming. 3. The licensee shall devote a minimum of 60% of the programming broadcast during each broadcast week to ethnic programs, as defined in the Radio Regulations, 1986, as amended from time to time. 4. The licensee shall devote a minimum of 50% of the programming broadcast during each broadcast week to third language programs, as defined in the Radio Regulations, 1986, as amended from time to time. 5. 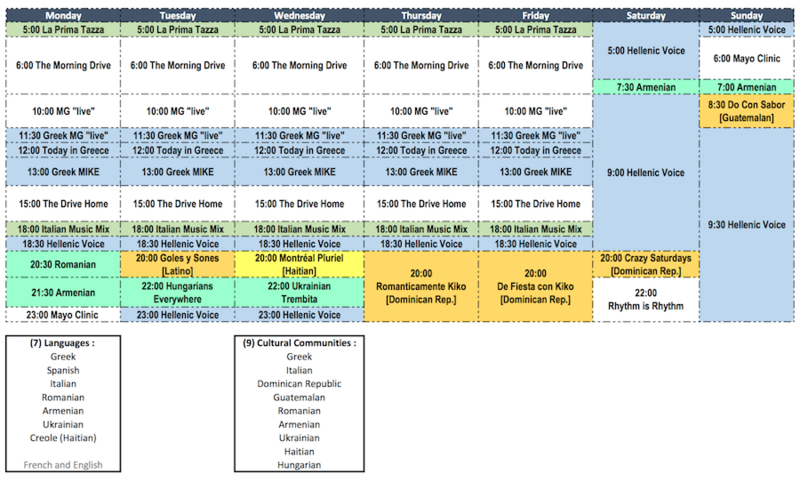 The licensee shall broadcast, in each broadcast week, programming directed to a minimum of eight cultural groups in a minimum of six languages. 6. The licensee shall ensure that at least 10% of the musical selections broadcast during ethnic programming periods during each broadcast week are Canadian selections. 7. The licensee shall provide an appropriate proof of payment for the entire outstanding Canadian talent development shortfall of $42,022 identified in CKDG-FM Montréal – Licence renewal, Broadcasting Decision CRTC 2010-428, 30 June 2010, by 31 January 2014. The station is proposing to keep these conditions, except the last, which has been fulfilled and is no longer applicable. Asked about the eight cultural groups it serves, CKDG listed “Greeks, Hungarians, Ukrainians, Romanians, Armenians, Italians, English and French Que?be?cois” in a letter to the CRTC. But English and French are not considered cultural groups according to the CRTC’s ethnic broadcasting policy, which means the station failed to meet that requirement. The station added programming last fall for Dominican, Guatemalan and Haitian communities to bring its number up to nine. CKDG’s conditions of licence require it to ensure 10% of ethnic songs and 35% of non-ethnic popular music are Canadian. But the commission’s analysis, based on a week in May 2015, shows it offered only 0.76% Canadian ethnic music and 24.1% Canadian non-ethnic music. CKDG blamed this on its “inability to keep adequate records” and on not sufficiently policing licence conditions for brokered programming. Is $4,000 enough to fix this? Unprompted by the commission, CKDG’s licensee Groupe CHCR (Canadian Hellenic Cable Radio), has offered its own penance for its wrongdoings: money. “Groupe CHCR submits that it will voluntarily contribute the combined amount of $4,000 to FACTOR and Musicaction ($2,000 to each organization) over the next licence term,” the application reads, referring to the two major Canadian music development funds that larger stations are required to contribute to. Requiring additional contributions is one of the options available to the CRTC. A short-term licence renewal is another. But it can also go further, imposing other conditions of licence, requiring the station to broadcast its failure to comply with its licence conditions, or in extreme cases suspending, refusing to renew or revoking its licence entirely. Needless to say, CKDG isn’t in favour of most of these options. It has managed to do this thanks mainly to the half-million it received from selling sister station CKIN-FM. We’ll see if they can use that money to make this sustainable. The CRTC is accepting comments on CKDG-FM’s licence renewal until March 15. *CORRECTION: An earlier version of this post gave the wrong frequency for CKDG-FM. With all the hoops they have to jump through, no wonder it’s all a mess. How are you supposed to broadcast higher percentages or even ANY percentage of Canadian music when you are an ETHNIC radio station? The purpose of ETHNIC is to showcase non-Canadian talent. In the CRTC’s eyes, I guess it can’t be purely ethnic… since it must incorporate Canadian music- which then raises the question: What is Canadian music? Are Celine Dion and Justin Bieber considered Canadian being that everything they do is produced in the US? I really dislike this CRTC business for messing with this. They can’t handle Bell, but they’ll screw around with all the smaller fish… Figures. The purpose of ETHNIC is to showcase non-Canadian talent. That’s not what ethnic means. And the policy already takes into account that ethnic programming will have more non-Canadian content, which is why it has a lower quota. What is Canadian music? Are Celine Dion and Justin Bieber considered Canadian being that everything they do is produced in the US? The CRTC defines Canadian-ness by the song, and uses the MAPL system to evaluate that song. If the artist is Canadian, and either the lyrics or music were composed by Canadians, then the song is Canadian. Bell stations are also subject to Canadian content requirements. The frequency is 105.1 not 101.5 which is CIBL. Ah, you’re right, of course. I’ve corrected the post. I think the CRTC sort of needs to get their heads out of the sand when it comes to Canadian content in relation to smaller stations. The requirements here are arduous to follow and maintain, and require some serious work time to keep up on. Ethnic stations face a bigger hurdle than mainstream sites. A site that is “top pop” as an example will fill most of it’s day with popular music, which is categorized once and then replayed over and over again, a computer keeping track of every song played, the mix, and of course, suggesting what songs to play in order to keep in compliance. For a smaller ethnic station, this may be a job that has to be done manually for each and every piece of music that is played on the station, and the possibility is that the music is never played again, or very infrequently. Even if it takes 1 minute a song to figure this out, it’s still a full time job to do this stuff (literally). It gets even worse (as noted) that the station runs brokered programming, which means they cannot control the content during that period. It may mean that they have to over compensate at other things to assure compliance. I would suggest that the CRTC adopt the same standards as they have with Canadian Content contributions: If a station makes less than 1.25 million of income, don’t burden them with recording keeping requirements that would be a significant cost to the station. It’s just seems like such an insane waste of the public’s money and the stations money to be making such a big deal out of it. There’s software available to stations big and small to manage music selection. All stations are required to have logs of what they air, and I don’t recall too many of them arguing to the CRTC that the logging and reporting requirements are too onerous. It gets even worse (as noted) that the station runs brokered programming, which means they cannot control the content during that period. All stations are responsible for the content they broadcast, brokered or not. I would suggest that the CRTC adopt the same standards as they have with Canadian Content contributions: If a station makes less than 1.25 million of income, don’t burden them with recording keeping requirements that would be a significant cost to the station. Feel free to propose that at the next review of the ethnic broadcasting policy. Wiff! Yup, the point went over your head. It’s not about logging in the sense of writing it down, rather the problem of figuring out if an obscure musical selection qualifies as Canadian, ethnic, the combination, etc. A song that is played only a single time as part of brokered programs is even a bigger challenge, as they must get a list of the musical content, it’s length, and then create individual records in the logging system to quantify this music. Unlike a top 40 or classic rock station that uses mostly known musical sources, the amount of work to keep an ethnic station properly logged and Canadian content status assigned is more work. Next time I will use shorter words for you, if need be. Ahh, so just expressing an opinion is no longer allowed, unless I follow a full formal procedure and make presentation to the CRTC? Nozzly of you. It’s not about logging in the sense of writing it down, rather the problem of figuring out if an obscure musical selection qualifies as Canadian, ethnic, the combination, etc. It’s not that complicated. Music distributors know when music is Canadian and pass that information along because they know those albums and songs get more airplay in Canada. Even college stations classify Canadian music properly. As for being ethnic, stations have the option to ignore that and just air 35% Canadian music across the board. And since most ethnic music is in third languages, it’s not that hard to pick it out. Logging and paperwork are a pain, and it gets ignored a lot. But licensees know they’re important and don’t try to argue that it’s unnecessary. Ahh, so just expressing an opinion is no longer allowed, unless I follow a full formal procedure and make presentation to the CRTC? No, but don’t expect the CRTC to change its policy if you don’t share your views with it on the record.